BEIRUT Syrian President Bashar Assad said in a TV interview broadcast Thursday that Russia has fulfilled some of its weapons contracts recently, but was vague on whether this included advanced S-300 air defense systems. Assad's actual comments differed from excerpts the TV station conducting the interview had sent to reporters in a text message on Thursday morning. In that message, the Al-Manar station owned by the Lebanese militia Hezbollah quoted Assad as saying Syria had already received a first shipment of such missiles. The Associated Press called Al-Manar after receiving the text message, and an official at the station said the message had been sent based on Assad's comments. In the interview, Assad was asked about the S-300s, but his answer was general. He said that Russia's weapons shipments are not linked to the Syria conflict. "We have been negotiating with them about different types of weapons for years and Russia is committed to Syria to implement these contracts," he said. "All we have agreed on with Russia will be implemented and some of it has been implemented recently, and we and the Russians continue to implement these contracts," he said. Assad also said that his forces will respond to any future Israeli strike on his country. Israel struck near the Syrian capital of Damascus earlier this month. Israeli officials said at the time they were targeting suspected shipments of advanced missiles purportedly intended for Hezbollah, a Syria ally. Asked whether Syria would respond to such strikes, Assad said: "We have told countries that we will respond to any strike with a similar strike." He says that the manner of the response "depends on the circumstance and timing" of the attack. Thursday's developments come as CBS News correspondent Margaret Brennan reports that U.S. Ambassador Robert Ford, one of the men trying to get both sides to the table at upcoming peace talks, will be stepping down from his post this summer. Assad said he agreed "in principle" to send negotiators to peace talks. In a new setback to international efforts to end Syria's civil war, the main Western-backed Syrian opposition group announced that it would not participate in U.N.-sponsored peace talks that were to have been launched in Geneva. The decision could torpedo the only peace plan the international community has been able to rally behind, although prospects for its success appeared doubtful from the start. U.S. officials, speaking on condition of anonymity because they were not authorized to speak publicly on the matter, said they have no evidence the missiles were delivered. Two Jordan-based Western diplomats told The Associated Press that some missiles arrived in Syria this week. The diplomats, who insisted on anonymity because identifying them could impede their intelligence gathering, said it would take between five to 10 days to make the systems operational. The U.S. and Israel had both urged Russia to cancel the missile deal, but Moscow said it would honor its planned weapons sales to Syria. The S-300s would make it harder for the international community to enforce a no-fly zone to assist the Syrian rebels fighting Assad  something it did in the 2011 civil war in Libya. White House spokesman Jay Carney said Wednesday that every option in Syria is on the table, including a no-fly zone. Russia's Foreign Ministry said the latest comments about a no-fly zone raise doubt about the sincerity of U.S. support for launching Syria peace talks. In a statement, the ministry cautioned the U.S. against a "bellicose agenda in Syria." The developments raise fears of an arms race  in Syria and in the wider Middle East. Earlier this week, the European Union lifted an arms embargo, paving way for member states to send weapons to rebels. There was no official comment from Israel. Defense Minister Moshe Yaalon said earlier this week that Russia's plan to supply Syria with the weapons was a threat and signaled that Israel was prepared to use force to stop the delivery. 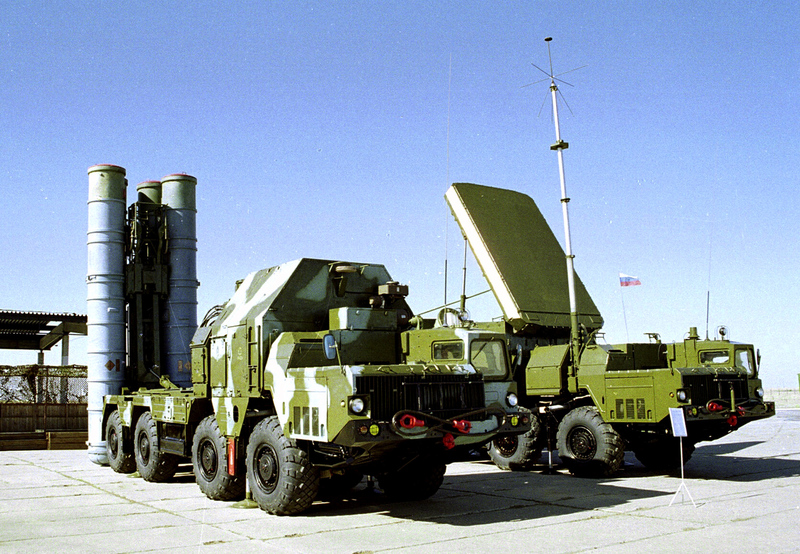 If Syria indeed received the first S-300s, the Israeli air force's ability to strike in Syria could be limited. The S-300s have a range of up to 125 miles and can track and strike multiple targets at once. Syria already possesses Russian-made air defenses. Syria did not respond to Israel's recent strikes. However, Syrian Foreign Minister Walid al-Moallem warned Wednesday that Damascus "will retaliate immediately" if Israel strikes Syrian soil again. It was not clear if there was a link between al-Moallem's remark and the Russian shipment. Meanwhile, the main political opposition group, the Syrian National Coalition, said Thursday it would not attend the Geneva talks, linking the decision to the battle for the strategic western Syrian town of Qusair. Iranian-backed Hezbollah is heavily involved in the 12-day-old push to drive rebels from the town. Coalition officials claimed Thursday that hundreds of people wounded in the fighting were trapped in the town. "The talk about the international conference and a political solution to the situation in Syria has no meaning in light of the massacres that are taking place," coalition spokesman Khalid Saleh told reporters in Istanbul, where the opposition has been holding week-long deliberations on a strategy for the Geneva talks. He said the group will not support any international peace efforts in light of the "invasion" of Syria by Iran and Hezbollah. The opposition's announcement came just a day after al-Moallem said the government would attend the planned peace conference in Geneva but laid out terms that made it difficult for the opposition to accept. Al-Moallem said Assad will remain president at least until elections in 2014 and might seek another term, and that any deal reached in such talks would have to be put to a referendum. Psaki, the State Department spokesman, said she hoped it was not the coalition's final word on the Geneva conference. She said Ford is in Istanbul trying to help the opposition sort through its internal problems. Once members have decided on issues such as expanded membership and leadership, the U.S. hopes they will recommit to peace talks, Psaki said. Lavrov, the Russian foreign minister, accused the coalition of trying to set pre-conditions, by demanding that Assad's departure from office must be the focus of any peace talks. He called such a demand "unrealistic." He urged the U.S. and Europe to "restrain those who are encouraging such unacceptable and aggressive approaches on the part of the National Coalition." If the diplomatic option is now off the table, following the opposition's decision, the West, including the U.S., will have to come up with a new approach. President Obama could face renewed pressure to help the rebels militarily. The U.S. had hoped a dialogue between representatives of the regime and the opposition could set a timetable for Assad's removal, said Salman Shaikh, director of the Brookings Doha Center. "That policy is now in tatters," he said. Meanwhile, fighting continued Thursday in Qusair, and the Britain-based Syrian Observatory for Human Rights, a pro-opposition group, said regime forces now control most of the town. Both sides value Qusair, which lies along a land corridor linking two of Assad's strongholds, the capital Damascus and an area along the Mediterranean coast. For the rebels, holding the town means protecting their supply line to Lebanon, just 10 kilometers (six miles) away. More than 70,000 people have been killed in the 26-month-old Syrian conflict that has had increasingly sectarian overtones. Members of Syria's Sunni Muslim majority dominate the rebel ranks and Assad's regime is mostly made up of Alawites, an offshoot sect of Shiite Islam.